When you come to iFLY get ready to be blown away- literally. It’s thrilling. It’s amazing. Experience the feeling of freefall as you float on a smooth cushion of air. There’s no parachute, no jumping, and nothing attaching you to planet Earth. It’s just you FLYING in the air. Super fun, super safe, and super cool! Includes an educational STEM package/lesson with each ticket. Please arrive at your specific arrival time for check-in. ● If your arrival time is 10:00am, your departure time is 1:00pm. ● The STEM Wind Tunnel Demonstration and Slide Show begins 30 minutes after check-in. ● There will be several activities happening for the students throughout the field trip experience: STEM hands-on activity, flight training class, gear-up session, and your 2 flights. 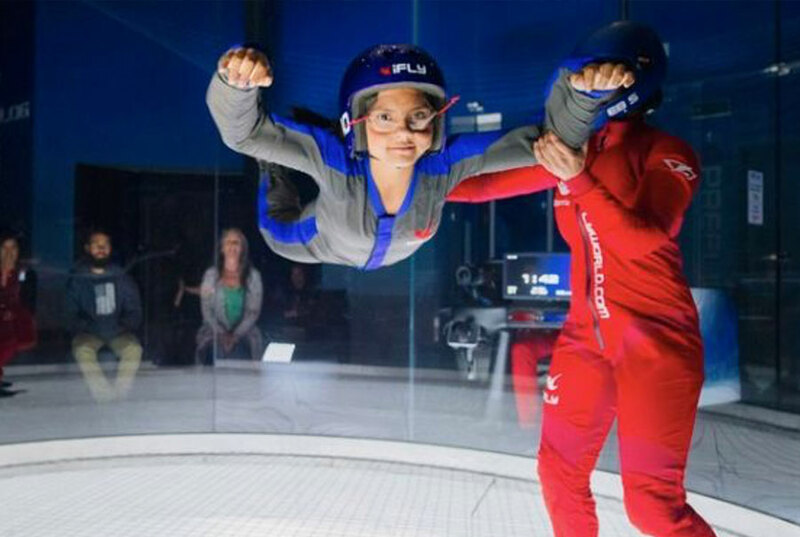 ● Upon arrival you will receive a detailed agenda from iFLY. ● You are more than welcome to have lunch/snacks onsite. Check in 15-20 minutes prior to event.